Cosmetic surgeons agree that the CoolTouch CoolLipo laser machine has bolstered their practices. CoolLipo wins praise for its power to treat body features upon which ordinary liposuction devices are largely ineffective, such as the small, yet cosmetically significant areas of the jowls and neck. CoolLipo treatments extend the range of care a practice can offer its patients. An expertly refurbished CoolLipo unit from SunrayLaser.com complements traditional liposuction devices because CoolLipo more effectively addresses cosmetic details; however, if fine detail work alone will correct or rejuvenate a patient’s appearance, CoolLipo is even more effective on its own. While CoolLipo excels in the treatment of small areas, in many practices, CoolLipo units have all but replaced conventional liposuction devices. CoolLipo’s unique handpiece enables physicians to rapidly aspirate fat and, with laser energy, concurrently tighten the skin on any size area of the body, including areas as large as the buttocks, abdomen, back, legs and arms. SunrayLaser.com takes pride in its capacity to offer advanced laser devices from CoolTouch, Inc. The CoolLipo is one of the most innovative lipolysis devices on the market. Cosmetic surgeons around the nation have noted increased requests for procedures with CoolTouch equipment, thanks to high-profile media recognition on television news programs in addition to The Wall Street Journal. CoolTouch, Inc. has been granted full clearance by the U.S. Food and Drug Administration to market the CoolLipo for laser-assisted lipolysis. 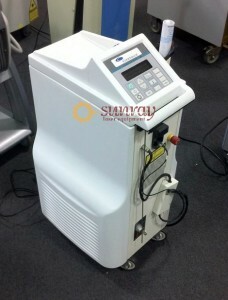 Every CoolTouch CoolLipo unit offered by SunrayLaser.com has been thoroughly refurbished by certified technicians. We guarantee that every unit will meet or exceed all applicable safety standards and perform to the operating specifications set by the original manufacturer. We promise total customer satisfaction. Let’s talk about how the CoolTouch CoolLipo can bolster your practice. Please contact us via the form below, and one of our laser consultants will contact you quickly. Our expertise in the cosmetic laser market helps us source equipment in excellent condition.